An extra long 36" hardwood maple mash paddle with a sanded finish made for MoreBeer!. The extra length gives you needed leverage to really stir a thick heavy mash from 5 to 40 gallons. The more common size on the market is a 28" non-sanded paddle... for the extra $10 you will love how this paddle feels in your hand. 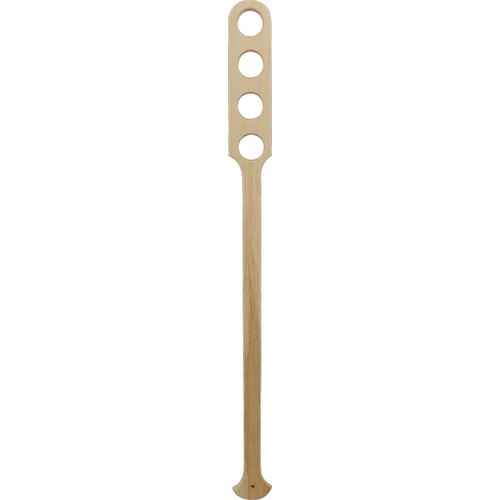 Hand carved in the USA by a artisanal wood worker our mash paddle has a very smooth, sanded finish but is oil free so as not to transfer any foam killing oils into your beer. Small circular hole at top of handle allows for easy hanging in your brewery. Big enough for any mash! The handle knob and paddle are favorable shapes. For use with my Morebeer LowRider. Has anyone used this paddle in a Grainfather? BEST ANSWER: Hi Arthur - The item i've attached will work perfect with your application. Thanks, I have one of those and a stainless steel paddle from Grainfather, but i was looking for something to make it a little easier. Never used in a Grainfather, but I suspect it would be way overkill. I started all grain brewing making 5 gallon batched stirred with a slotted spoon. I then switched to a 26" whisk that worked better. I moved up to 10 gallon batches, then 16 gallon and switched to a stainless steel paddle with holes. It worked great but I was always looking at the wood paddles wondering how they would work. I finally bought one and it is the best! It moves through the mash easier and does a better job of breaking up any clumps. Highly recommended! I had been using a cheap plastic paddle and/or a SS spoon. This paddle is well worth the money and performs much superior - dough balls have been eliminated. You need to buy one of these. My last brew was 25 pounds of grain in a Blichmann pot. Doughed in half followed by other half. Works flawlessly. Total dough-in time less than 5 minutes. Great quality. Cleans up easy. Also used to mix in my water salts. Should have bought this years ago. I bought this so I wouldn't have to stir my mash with my spoon anymore. It breaks through the grain unbelievably well. My last grain bill was 14 pounds; I added all the grain at once and managed to stir through it all with little effort. I got this as a christmas gift and have used it on 2 brews so far. Both beers had a #17+ grain bill and with the last I tried something new. I put all #17 into the mash tun at once (instead of a bit at a time, stir, bit more, stir...) and got after it with this paddle. Within a minute the mash was mixed, no dough balls, and a suprisingly quick start to my brew day. I'd used a SS paddle with no holes for a few years, and other spoons/stirrers, but there's no going back after this one. It's a great product, works well, and cleans up easily.